This is my go-to quick lunch/dinner if I’m in a rush or just craving some delicious Mexican-style food. 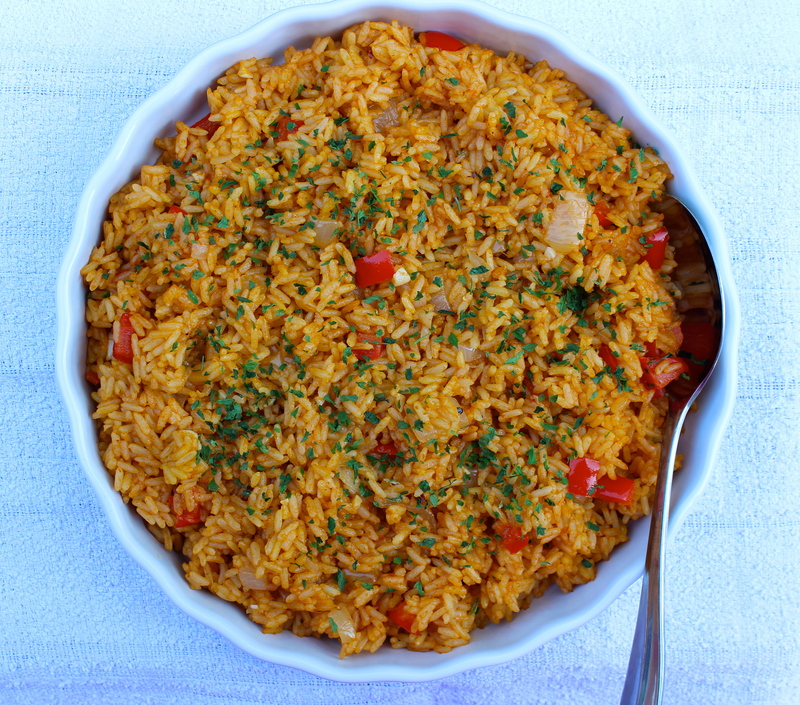 This one-pot red rice is as easy as it gets, taking just half an hour to make. It’s healthy and packed full of amazing Mexican flavour and spice. A must try recipe for anyone who loves Mexican food! Heat the oil in a large saucepan. Sauté the chopped onion, garlic and peppers for about 5 minutes until they’re starting to soften slightly. Season generously with salt and pepper. Add the garlic and spices (cumin, cilantro/coriander, paprika and chilli) and toast for a minute or so until fragrant. Add the tomato purée and cook for a further minute. Now add the rice and cook for another couple of minutes to toast slightly making sure it doesn’t catch too much on the bottom of the pan. Add the stock and bring up to the boil. Once boiling either simmer for 20 minutes until the rice is cooked and all the stock has been absorbed and the rice is fluffy or alternatively you can braise the rice in the oven for the same amount of time at 200°C / 180°C Fan / 400°F / Gas Mark 6. Tip: Use a fork to stir the rice, this will ensure that the rice will be fluffy and not sticky. Take off the heat and add the lime juice, fluff the rice with a fork. Season with extra salt and pepper if needed and then cover and allow the flavours to infuse for 5-10 minutes before serving, then serve the rice warm or cold. Rice once cooled completely to room temperature will store in an airtight container for up to 4-5 days. Don’t reheat rice more than once.